Home » Cars » Countries » Featured Articles » Get off your hobbyhorse, the new Renault Twingo is the tops! Get off your hobbyhorse, the new Renault Twingo is the tops! For much of my motoring life, I have believed firmly in the adage that ‘small IS beautiful’. Despite my stature (two metres tall and…these days…around, too, with size 14 plates o’ meat), I have always preferred the sub-compact species of motorcar. Possessing quite the opposite of the well-fashioned ‘Bonaparte Complex’, which insists on nothing less thrusting than a throbbing V6 engine, located beneath a bonnet the length of the Ark Royal’s deck, even though the driver is likely to be squeezed to within six inches of the tiller, in my book small cars rock! Thanks, due to various reasons, some of which will have me cheering, I no longer have a requirement to fill a car’s back seat with urine, or vomit-scented ankle-snappers. Nor do I feel the need to transport the older, sweat and mustiness of teenagers. My demands on the boot are minimal, apart from accommodating the weekly shop, or the occasional overnight bag. As long as the driver’s chair is height, as well as rake and reach adjustable, through a moderate range, I am delighted. As long as my access to that chair is unimpeded by too narrow a daylight-opening and that the steering wheel can be adjusted upwards to clear my long legs and to avoid knocking knuckles off knees, I am delighted. The market has been developing sub-1.0-litre engines left, right and centre. My personal transport (if you read through the files) is a Skoda Citigo. It is powered by a sub-1.0-litre engine. A three-cylinder unit that develops 75bhp. It is adequate, as the car itself only weighs a smidgen more than a family bag of potato crisps, which means modest but lively performance, allied to a zero-cost VED, Group 1 insurance and a fairly regular 60mpg. I live in motoring nirvana, unburdened by automotive debts to the state and that is what the current crop of tiddlers is supposed to be all about. They make life affordable, when all the rest of it is like the archetypal albatross. So, what is it that makes the Renault Twingo so flaming wonderful? It does not help that it is Gallic in origin but only in a head office sense, as its design was carried out by Dutchman Laurens van den Acker (formerly Mazda‘s design chief) and the car is actually produced in Slovenia, which is okay. It means that the Gauls can justify charging a small fortune for it, to refill their much-depleted and troubled coffers, as the production cost-per-unit is a lot less in Novo Mesto, than it might be at Valenciennes. Most interestingly, the new Twingo, with its rear-engine, is also the basis of the all-new smart car, from Mercedes-Benz, a factor that bodes well for the popular Teutonic city car, which will be returning to the new car scene, with an all-new ForFour model that will be all but the same as the Twingo, certainly in the mechanical layout area. Having failed with its forerunner, smart is intending to make amends and sharing manufacturing costs with Renault gives it a better hope than the previous Mitsubishi-derived generation ever did. While I am looking forwards to the new smart, also in abbreviated ForTwo form, the Renault presently has my vote. It is compact but, like the majority of today’s small cars, it is tremendously accommodating and I CAN fit in, with ease. It is also very comfortable, although I might have preferred a small amount of extra lateral seat bolstering to stop me from hanging onto the steering wheel during spirited cornering. Although there is a lesser powered version, I was determined to drive the model that I believe will generate the greatest following, which is powered by an 898cc, three-cylinder engine that boasts turbocharging and an engaging 90bhp. The forced induction helps it to produce a tremendous slug of pulling power from as low as 1,500rpm and the Twingo will break the 0-60mph benchmark in a comfortable 10.5 seconds and it does feel every bit as zesty as the figure states. Its top speed is given as a believable 103mph (I even saw an indicated 115mph on more than one downhill occasion during testing). However, even thrashing it to within an inch of its near-unburstable existence, its fuel return was in excess of 43mpg, which I admit is somewhat shy of the 65.7mpg Official Combined figure, although I believe that most owners will obtain 50-55mpg with ease. It emits 99g/km CO2, which means a no-charge VED. Its five-speed manual transmission (a twin-clutch automated version will be launched in the spring of 2015) works beautifully, slicing up the ratios as sweetly as it needs to, through a chunky and positive shifter. Considering that it is as remote as a shift might be, the transmission being between the rear wheels, it works very well. Checking around the car reveals that the front tyres (185/50×16) are narrower than the rears (205/45×16), which goes someway towards explaining the high level of grip at the back of the car. Try as I might, I could not unstuck the rear and even resorting to the handbrake (on a fairly low-mu surface) was undramatic. However, the rearward weight bias of the engine only becomes obvious at speeds well in excess of the national speed limit, At around 90mph, the car reveals that it is not keen on crosswinds and the front-end can become a little ‘loose’, although not unpredictably so. I hinted earlier that the Twingo is priced slightly higher than most of its rivals, although a base version will cost from £9,495. The test car, in Dynamique Energy TCe 90 stop-start form pictured, was a whopping £12,935, which even makes a loaded VW Up! look conspicuously inexpensive. To be fair, it was laden with extras, including the diamond-cut alloy wheels that boosted the price tag from a more reasonable £11,695. Of course, Renault has a past peppered with rear-engined models, such as the Dauphine, Floride, 8 and 10. As well as questionable handling, rear-engined cars used to be notorious for their lack of cabin storage space. 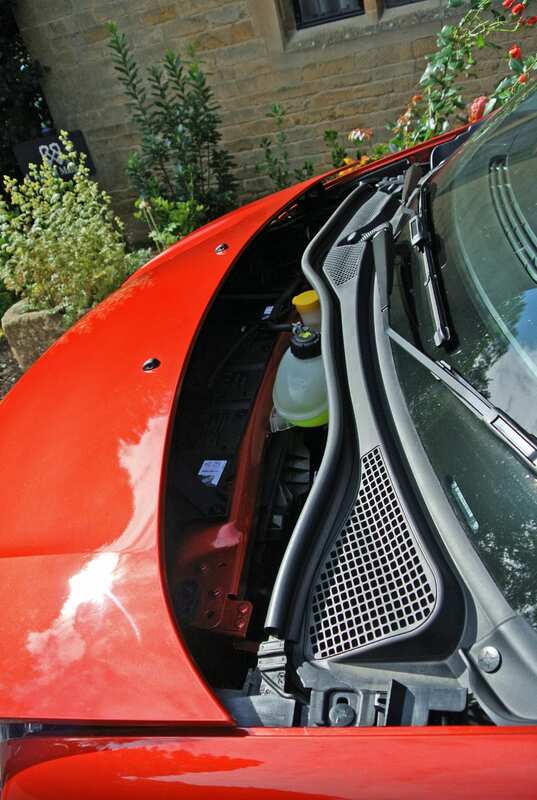 The bonnet of the Twingo is simply a lightweight cover for access to some service items. There is not much room for anything else. The door pockets are deep and meaningful and the front passenger seat can fold flat, if you want to carry a folding ladder, or a surfboard. The rear seats also fold forwards to increase the size of the load deck, to a maximum of around 980-litres, which sits at bumper height, because of the rear-mounted engine. There is space beneath the back seats for smaller items and an optional net will secure them in place. A rather natty, Velcro-lined, triangular section of trim helps to separate items that sprawl onto one side of a folded rear seat from a rear seat occupant. With a turning circle that would shame a London Black Cab, the Renault Twingo is one of the most manoeuvrable motorcars I have driven in years. It puts to shame the 24 feet of a classic Triumph Herald. Yet, most of the time, the driver only requires to ‘think’ the Twingo around obstacles, or bends. Feedback levels are excellent. The car’s suspension provides a smooth and untrammelled ride quality, its long wheelbase affording the car a loping quality more befitting of a somewhat larger model. I am really impressed by the new Twingo. While it is not the prettiest tiddler on the block, it does possess a sense of purpose, is immensely tough (structurally rigid) and it drives supremely well. Its low operating costs will win it many fans and, if past Twingo sales performances are anything to go by, it will become a most popular model for the company, which is good, as Renault really needs a good result. It is definitely my favourite small car of the moment, which sets the bar quite high for the next potential rival.